Pork chops cook quickly on a griddle. Electric griddles provide enough heat to cook most things you'd generally cook over a grill or stove top -- including pork chops. 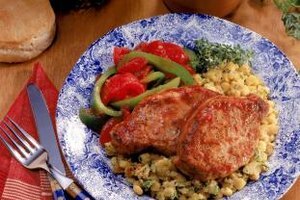 The high heat cooks the chops relatively quickly and sears in the natural juices and flavors. The process happens quickly, so it's important to watch your chops, or at least stay near them, to ensure they're not dry and overcooked. A meat thermometer helps make sure the pork chops reach a safe temperature before you eat them. If your pork chops are frozen, defrost your pork chops in the refrigerator until they're completely thawed so the meat doesn't burn or dry out on the outside before it's cooked in the middle. Grease your griddle lightly with vegetable oil or lard. Preheat your griddle so the temperature falls in the 325 to 375 degrees Fahrenheit range. Choose the high or medium-high setting if your griddle doesn't have exact temperature settings. Season both sides of your pork chops. Use salt and pepper, then chose seasonings such as sage, thyme, rosemary or garlic, depending on your preference. Wait until the oil on your griddle begins to ripple or lightly smoke, then place each pork chop flat against the griddle without moving it around. Allow a few inches of space between each pork chop so that steam can escape. Cook the pork chops for five minutes on one side, without touching, poking or flipping them or sliding them around in the pan. This allows a crust to form, which keeps in more of the natural juices and enhances the flavor. Cooking time will depend on the thickness of your chops. Check one pork chop for a medium-brown crust. Continue cooking if the chops aren't browned yet. Turn them over once they've developed their crust. Continue cooking, again without touching or moving the meat. 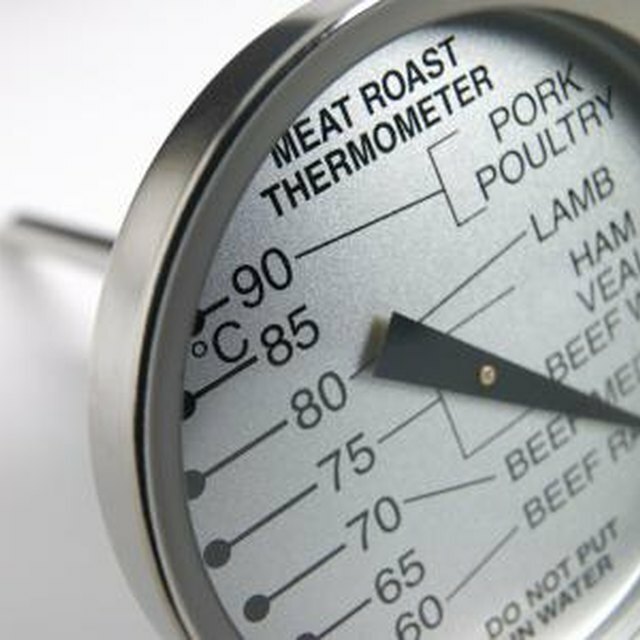 Use a meat thermometer to check the temperature at the center of your pork chop at its thickest point. Remove the chops from the griddle and place them on a plate when the internal temperature reaches 145 degrees Fahrenheit. Cover the plate with foil and allow the pork to rest for three to five minutes. Serve immediately, then refrigerate leftovers. Another method of seasoning your pork chops and keeping them moist is to marinate them for a few hours before cooking. For an easy marinade, mix olive oil, lemon juice, soy sauce, honey or brown sugar, and your choice of spices. Remove your chops from the marinade and pat them dry before cooking.